According to recent statistics from the Guinness World Records, Australia has the world’s highest rate of pet ownership at over 60%. So many animals to give us the unconditional love which humans crave. But with that love comes a price – the pain of loss when our pet dies. We recognise that loss is a part of life. Sometimes it seems we’re always losing something, or someone. Yet when a pet dies, we can be surprised or shocked at the level of pain we may feel. I’ve just experienced it. 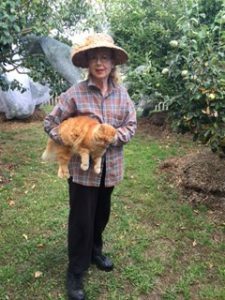 My well-loved cat Ginger died last week. Suddenly, Ginger just stopped eating. I took her to the vet, who prescribed medications which I administered diligently. I fed her with a syringe but she just refused to eat on her own and slept all day. Then on my evening walk in the garden I found her. She was in her sleeping position, but devoid of life. I dug a grave for her in the garden near a variegated Buddleia and placed a marker and flowers. My family have all offered sympathy as the’re pet lovers too. But I’ve felt a great sense of loss. Ginger was my gardening companion and we were about to embark on our spring campaign together when she left me. I’ve packed away the cat dishes. I’ve hurried past the cat food section in the supermarket, without lingering to select tasty morsels as in the past. It’s the little things you miss. The mat by the fireplace, where Ginger purred happily in the evening, is bare now. I used to listen for the noise of the cat door swinging on its hinges when Ginger came in during the small hours. Now there’s silence. From the bedroom, I could hear the crunching sound when she ate dry cat food at night. All gone. It’s nearly a week now since Ginger died. My daughter has framed a photo me with Ginger and included a piece of fur from Ginger’s mat. I’m going to get another cat when the mourning period ends – actually, I think perhaps two – to double the love and attention I can lavish on them. And I’ll enjoy them to the utmost and revel in their friendship. But in the meantime, I’ve acknowledged the pain, because it tells me how much pets mean to us. They give us love and a sense of connection which is unrivalled. I’m going to have more cats. I’m going to risk the pain of loss. Many thanks for your comments, greatly appreciated.